Such readers, in fact, will find little here that is new—and not just because Politics of Affect largely reprints existing interviews, ranging from roughly 2001 to 2013 and framed by a brief preface and a critique of twelve common “misconceptions” (204, and “missed conceptions” 205) of affect that Massumi offers “in lieu of a conclusion” (204-215). Of the volume’s 28 footnoted citations, 12 of them—almost half, that is—are of Massumi’s own individual or collaborative works. This volume, then, is perhaps of less use to veteran readers of Massumi than it is to neophytes, and to those (and I count myself among them) who seek clarification about just what exactly is so political about contemporary incarnations of Deleuzian strands of affect theory. For these readers, Politics of Affect delivers an unusually clear and comprehensible set of arguments, a few of which I will address here. Usefully, the book’s format offers a series of stand-ins for potential readers. Its series of interviewers range from enthusiastic elaborators of Massumi’s ideas to those more interested in positioning Massumi’s work in its Spinozist-Deleuzian lineage or voicing common points of disagreement and confusion. Interviewer Joel McKim, for example, asks Massumi to respond to charges that “affective politics” are at worst “inherently fascistic” (65) and at best apolitical. “I can see the importance of this […] for understanding processes of creativity and invention,” McKim admits, “but in what way precisely is this political?” (67-68). In fact, argues Massumi, affect is not exactly political, and it certainly belongs to no single political orientation. Rather, “affect is proto-political. It concerns the first stirrings of the political. […] It is the cutting edge of change” (ix). Nor can affect (of the sort under discussion here) be intentionally deployed in the service of any particular political aim: “It cannot impose itself. It can only catch on” (105). This brand of affect is characterized by a capacity to act and be acted on (to affect and be affected); it is not the acting. Affects “are our angle of participation in processes larger than ourselves” (6). They are not contained within a subject. Rather, affect is best discussed, argues Massumi, through the language of thresholds (3), “openings” and “grey areas” (39), or “in-betweenness” (48). It is about orientations toward events—orientations that make available “the virtual co-presence of potentials” (5). Affect is not a thing, like a feeling or an emotion; an “emotion is a very partial expression of affect” that “only draws on” certain “memories and only activates certain reflexes and tendencies” (5). Emotions, for Massumi, have their own political utility: “Joy can be very disruptive” (44); and “anger and laughter are […] powerful because they interrupt a situation. […] They interrupt the flow of meaning that’s taking place” (8). These emotions can express affect, and they can result in “an affective change in [a] situation” (11), but they are not affect itself, which co-exists with process, tendency, and orientation, not the kinds of namable, stable concepts implied by emotions and feelings. We might ask McKim’s question again: yes, okay, “but in what way precisely is this political?” (68). Even Massumi’s most productive, political versions of affect are temporary and potential immersions and attunements that we cannot “pre-define” (117). The closest we can come to diagramming affect in advance of the political (or other) event is to think of it as “a cartography of potential. It’s about techniques for moving into and out of the immersive field of life complexity in a way that is oriented, or reorienting, but not in pre-articulated directions – inventively” (117). It is perhaps no wonder that Massumi’s not-conclusion will finally resort to constructing a negative definition of affect, by repeating what it is not: it is not “individual” (205); it is not “asocial” (205); it is not outside of culture (208); it “is not prescriptive” (209); and, importantly, it is not necessarily “good” (209). It “can be fascistic or progressive; reactionary or revolutionary. It all depends on the orientation of the transindividual desires speculatively gestured into motion” (209). This is how and why we should (and, Massumi argues, must) understand the politics of affect. Affects and relational fields can, are, and will be used by, for example, “the capitalist logic of surplus-value production” (21). Like Deleuze (or related contemporary thinkers, Hardt and Negri), Massumi is more accurately described as an anti-capitalist than as, say, a doctrinaire brand of Marxist. He finds “troubling and confusing,” in fact, “a certain kind of convergence between the dynamic of capitalist power and the dynamic of resistance” (21). As a result, much space in Politics of Affect will be dedicated to rejecting “traditional Marxist notions of ideology critique and vanguard action” (107). Ideology critique does not sufficiently recognize change as primary; “power structures are secondary effects of affective encounters, and ideologies are secondary expressions of power structures. Ideology is on the side of effects – twice over” (93). If we want to be on the side of causes, we must think in the micro, rather than the macro; we must think of process, not structure. “Any stabilizing structuring is emergent, and self-improvised. This makes variation and change more fundamental than the reproduction of the same.” The traditional Marxist’s view of “society as a structure […] is inverted” (87). So, since we have no stable structure to resist, a productive, affective politics, “engages becoming, rather than judging what is” (71). It orients itself toward potential, but toward no specific potential outcome. It primes potential change: “Micropolitics, affective politics, seeks the degree of openness in any situation, in hopes of priming an alter-accomplishment. Just modulating a situation in a way that amplifies a previously unfelt potential to the point of perceptibility is an alter-accomplishment” (58). Massumi argues that the way around coagulation, the way around structure, the way around the cycle of ideology and counter-ideology, the way around hardened presupposition, is a turn to affect as strategy, orientation, “main ethical concern” (34), and critical mode of understanding: “affect is now much more important for understanding power, even state power narrowly defined, than concepts like ideology” (32). If McKim’s question stands in for a skeptical reader looking for a “precise” politics of affect, rather than a mere creative orientation, such as the brand we imagine as best suited for artistic invention, then this volume’s response is that the two impulses are not so far apart. Massumi’s affective approach to politics is “in some ways a performative, theatrical or aesthetic approach to politics” (34). Perhaps frustratingly, even he is “not exactly sure what that kind of politics would look like,” but, “in some basic way it would be an aesthetic politics, because its aim would be to expand the range of affective potential – which is what aesthetic practice has always been about” (36). To expand the range of affective potential is to prepare for potential openings and opportunities for movement and change, to make the body “attuned to […] certain regions of tendency, futurity and potential” (56), rather than making it rigid (37) in preparation for a specific “event” that “can’t be fully predetermined” (57). Necessarily, Massumi’s argument “does not arrive at any final answers. It does not even seek solutions” (xi). His non-goal goal is, however, revolutionary. It’s just not in the service of any particular revolution. He is out for the “disabling or disenabling [of] presuppositions” and the “implant[ing of] new presuppositions” (117). That is, Massumi’s politics does not seek to change our minds so much as it seeks to reorient what shapes our minds. He wants to “implant new tendencies into that hyper-complex ecological field of life” (117). It’s an attempt at rewiring that gets to the heart of current philosophical questions about perception and presupposition. Massumi insists that one’s participation in any event “happens before you know it – or as you know it, abductively. Active participation precedes conscious perception” (195), so we should aim to be open and oriented toward potential and possibility. This is where we will find “degrees of freedom” because “there are any number of things that could happen […] that might modulate the field’s complexion of potential, altering its presuppositions on the fly” (195). 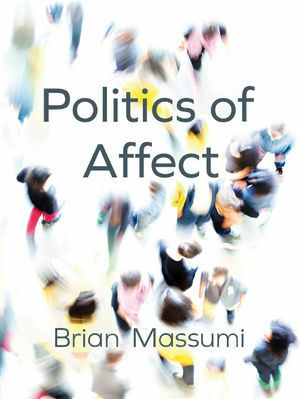 To buy into Massumi’s politics of affect, then, one must not only agree that his micropolitics is politics (and is politics enough), but must also consider much of Marxism—as well as “political actions that only operate in terms of the self-interest of identified groups occupying recognizable social categories like male/female, unemployed/employed”—ultimately of “limited usefulness,” doomed to result in “creating a sort of rigidity—a hardening of the arteries!” (42). Just as his politics of affect and its cartographies of potential are aesthetic but not just that, so too does he leave room for “defending rights based on an identification with a certain categorized social group, that asserts and defends a self-interest but doesn’t just do that” (42, emphasis added). Paul Ardoin is assistant professor of English at the University of Texas at San Antonio and a general editor for Bloomsbury’s Understanding Philosophy, Understanding Modernism book series. His work on affect and philosophy appears in such venues as Philosophy and Literature; Journal of Modern Literature; Counter/Text; and Angelaki: Journal of the Theoretical Humanities.